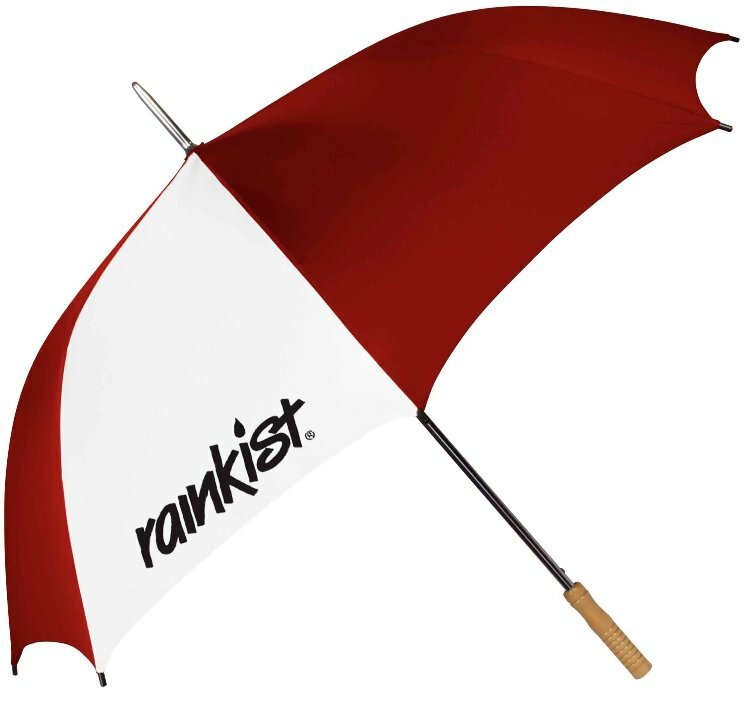 Get your logo on a best value Rainkist PK Golf Umbrella for advertising. Features are nylon fabric, steel frame, auto open and wood handle. The one off imprint panel really improves the POP of your logo. Overall size of the umbrella is 60" arc x 37 1/2" folded length. Rainkist limited lifetime warranty. Bulk packed in carton. Price includes a one color imprint on one panel 10" w x 8" h.
add $65 setup & running charge of $1.69 each unit. Factory repeat order setup $30.00 & run charges. I was searching for a good quality umbrella with my logo at low price and this is the only site that I found it. Rainkist brand name, great quality umbrella and our logo really printed well. I don't know how PII does this at such a low price however I won't question, just hand them out to my customers and be happy. Satisfied completely and will be back to order again.